Wellness Camp is about aligning body, mind, and spirit with a balanced flow of energy. The result is a life of greater wellbeing, deeper satisfaction, and the ability to maximize human performance in all areas. This camp is for anyone at any level of health & wellbeing who desires to deepen their commitment to their own personal journey toward having a life they truly love. The Wellness camp is designed to give you tools to assess where you are in your personal journey to wellness. It will introduce you to practices that can help guide and support you toward creating a plan for your own personal growth as well as move you forward. A tight knit staff of wellness professionals will offer a variety of workshops in their particular areas of expertise. Each workshop is designed to help you in someway integrate body, mind, and spirit. Integrating all areas of our life is what brings about whole-person WELLNESS. Starting where you are, there is always room for improvement, yet there is also power in being able to accept your current realities while planning a path toward your ideal. Your reward is added vitality, greater engagement with life, and improved health. The seeds of wellness you plant now will ripen for years and even decades to come. During the camp, you can choose from multiple workshops that will focus on integration of your body, mind and spirit. There will be different styles of yoga, eastern and western forms of massage, energy work, meditation techniques, work with essential oils, Bach flower Remedies, Chinese medicine, acupressure, movement classes and more! Of course, deep relaxation is also part of whole-person well-being, so there will be plenty of time to relax in the pool, hot tub and sauna. As part of your commitment towards greater wellness, you will be given the opportunity to get started before the camp begins. All participants in the Wellness Camp will receive a 1-year subscription to the Wellness Inventory, a powerful online suite of personal development and wellness enhancing resources. Prior to arriving at the Wellness Camp, you are asked to take the online Wellness Inventory assessment. 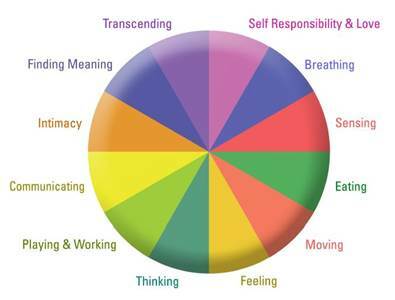 The assessment helps you look objectively at twelve dimensions of your life. Completing this will help you decide which workshops will best assist you in your own self growth. You can also use this tool to set and track goals in all areas of personal wellbeing throughout the coming year! Along with the 1-year subscription to the Wellness Inventory, our staff of wellness professionals will provide yoga DVD’s, access to YouTube videos along with easy to follow recipes for the healthy, delicious foods you will experience at the Wellness Camp, and other helpful tools. Your wellness goes beyond the dates of the camp. Our staff wants you to have the resources you need to integrate these powerful, transformative experiences into your everyday life. Everyone who registers for Easton Mountain’s Wellness Camp will receive instructions on taking the Wellness Inventory assessment about 1-month prior to the camp. Instructions will be sent to your email on record. Men at an outdoor buffet table on the grass. Includes meals, best available housing, programming that does not conflict with 3 required hours of volunteer work daily.